When I say “macaroni and cheese,” I feel happy — as do most of us. Even if our adult selves rarely indulge in one of the world’s most comforting foods. We can dream, right? We all remember the mac and cheese from our childhoods when our moms and dads prepared the boxed version before the babysitter arrived — and our parents would snag small bites off our plates. Let’s face it: even if it’s from a box, mac and cheese is pretty irresistible! But why use boxed mac and cheese when making it “from scratch” is so much tastier and nearly as simple? Start with great Cheddar cheese and you’re halfway there. It’s easy to grate cheese in a food processor, but if you find a good pre-grated cheese, go for it if it makes life easier. I like to start with leeks, which I cook in butter so that they meld seamlessly into the casserole, adding their own mildly earthy, onion-like taste. Clean and chop them ahead of time and refrigerate them until you’re ready to cook. I sometimes cook the pasta earlier in the day. Make sure it’s no softer than al dente (has a little bite). Drain and toss it with a couple tablespoons of olive oil, then cover with plastic wrap and let it sit on the kitchen counter for a few hours. Even better you can make the casserole the morning before you plan to serve it. Let it cool, cover, and refrigerate. About an hour before dinner, take the mac and cheese from the refrigerator and let it sit on the countertop; to take the chill off. Finally, pop the dish in a 325 ͦ F oven for 30 to 35 minutes, or until hot and bubbly. Most of the time, I make this in a large casserole dish (13-by-9-inches) but have also divided it between smaller dishes, or even small, oven-safe skillets. I like the way the skillets look, plus if they’re cast iron, they hold heat beautifully. Your kids will love this mac and cheese, but so would the whole family (that means you!) and serve it with a make-ahead salad. You can even make it a side dish to make-ahead chicken and have the entire meal ready to go ahead of time. Preheat the oven to 400°F. Spray a 13- by 9- by 2-inch baking dish with cooking spray. Melt the butter in a large saucepan and cook the leeks, covered, for 10 to12 minutes or until the leeks are softened but have no color. Uncover the pan, sprinkle the flour over the leeks, and continue to cook for about 1 minute longer, stirring constantly. Add 3 1/2 cups of the milk, bring to a boil, reduce the heat and stir in 3 cups of the cheese and the mustard. Remove the pan from the heat and stir until the cheese melts and the sauce is smooth and creamy. Add the salt and season to taste with the pepper. Meanwhile, cook the pasta according to package directions so that it is al dente. Drain well, add the pasta to the cheese sauce, and then gently stir in the remaining 1/2 cup of milk. 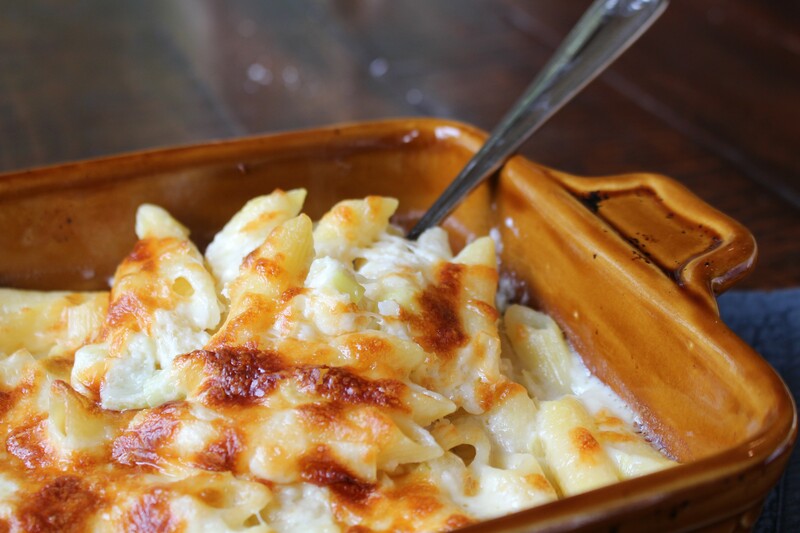 Pour the pasta into the prepared baking dish, top with the remaining cup of cheese, and bake for 25 to 30 minutes until just golden brown and bubbling. Serve hot.